I just woke up from a little cat nap, that actually involved a cat as Cooper and I curled up on the couch, breathing deeply, eyes closed, and unaware of anything around us, including the movie on the TV. Snowy Sundays were made for naps! Yesterday was my Dad’s Birthday (Happy Birthday Daddy!) and Tuesday is my Mom’s Birthday (Happy Birthday to you too Mom!). To celebrate, we all went to the casino yesterday and when we ran out of money, ate dinner at their awesome and creative burger place. The BOY ordered the largest Oreo milk shake and the biggest burger EVER! Then we came back to our house for desert and presents. Due to the snow storm, my parents didn’t stay too late, but my brother and his fiancé spent the night. We were all finally recovered from the last time they spent the night. Shortly after the Blackhawk’s game, a rematch Wii tournament began. We were back to our favorite games of bowling and tennis and Cooper tried to keep up with all of the action. Early in the week, I made Thai Peanut Chicken. I like to use homemade peanut butter in recipes like this I tried to be lazy and use my blender to make the peanut butter, which was a major fail. I ended up having to pull out my mini food processer which worked fabulously. 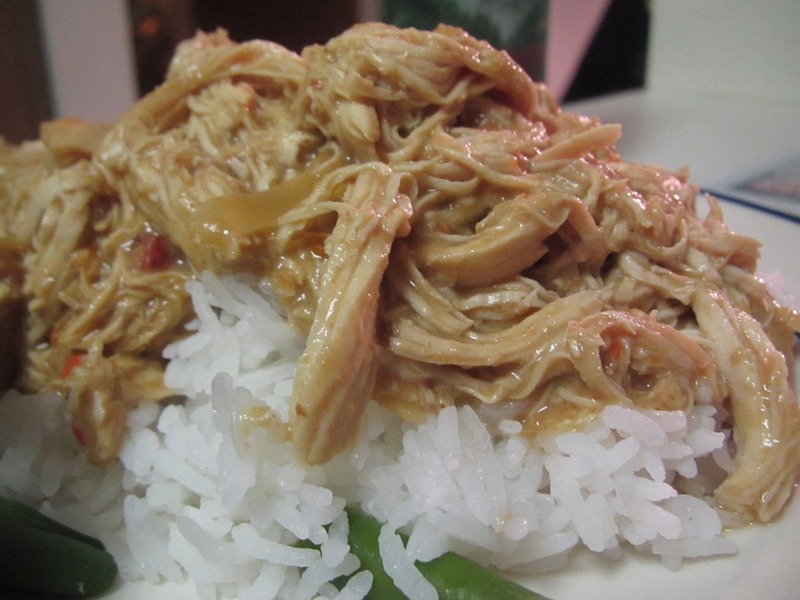 This recipe is similar to my other favorite crockpot Thai recipe. The flavors are wonderful and I’m a sucker for shredded chicken. And the leftovers were even better! After my next cat nap! In a bowl, mix together peanut butter, lime juice, vegetable broth, soy sauce, and cumin. Pour sauce over chicken. Cook on low for 3-4 hours. Do not overcook. Shred with two forks and let sit in sauce for another 30 minutes or so. 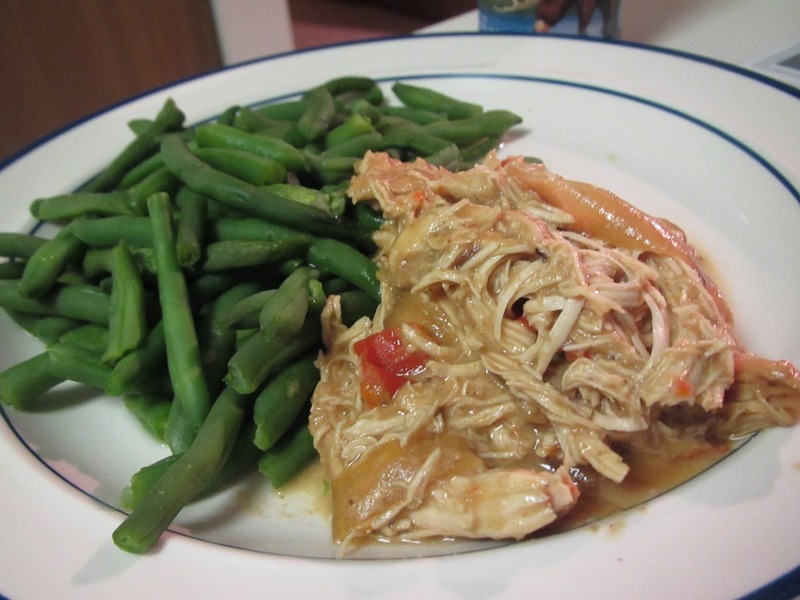 Remove from slow cooker and serve over brown rice. Top with scallions. Love that cupcake, so adorable!! How many people did it feed? We had 4 and there were leftovers but we also had an ice cream cake (my dad’s favorite). My mom is obsessed with the frosting at this bakery so I knew she would LOVE it! I thought the Vitamix was awesome at nut butters which was making me feel bad about my blender. A food processor is a MUST! I love making energy bars in their too. You had me at ‘crockpot thai’!! Yum yum! This is really easy and super tasty!!! Enjoy! I definitely need to know the name of that casino. I need one of those milkshakes! 🙂 The burger looks amazing too! I am reading your posts out of order and was wondering where the picture of the cupcake was!! 🙂 That oreo milkshake looks amazing!! It was pretty awesome and my mom was excited since it came from her favorite bakery!